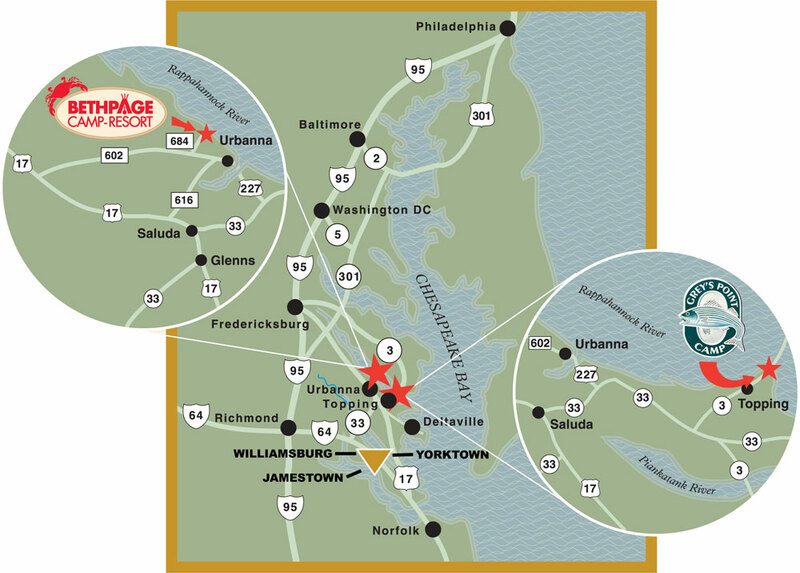 Located between Washington, D.C. and Williamsburg, Virginia, we are convenient to many well known Virginia attractions. Traveling south on I-95, Exit US 17 south at Fredericksburg. Follow 70 miles, watch for signs to Bethpage. Look for the Middlesex county line and Virginia Motor Speedway then Turn Left on RT 602. Travel for about 5 miles, look for Bethpage sign and then turn left to campground entrance. Traveling south on US 301, Cross the Potomac River Bridge into Virginia. Go 14 miles to Port Royal and US 17, Take US 17 south. Follow for 50 miles, watch for signs to Bethpage. Look for the Middlesex county line and Virginia Motor Speedway then Turn Left on RT 602. Travel for 5 miles, Look for Bethpage sign and then left to campground entrance. Traveling north on I-95 or I-295, Exit on to I-64 east, Follow I-64 to Exit 220 West Point RT 33, Follow RT 33 through West Point to US 17. Turn Left on US 17 North, Turn Right on RT 616 (Watch for large Urbanna billboard on the right). Follow RT 616 to stop sign (end of road), Turn Left on RT 602 for 1/4 mile, Look for Bethpage sign and then right to campground entrance. Use I-64 to US 17 North, Follow US 17 North across Coleman Bridge 35 miles, through Gloucester, 1 mile north of Saluda, Turn Right on RT 616 (Watch for large Urbanna billboard on the right). Follow RT 616 to stop sign (end of road), Turn Left on RT 602 for 1/4 mile, Look for Bethpage sign and then right to campground entrance. Click on the image to see an enlarged version of this map.